Under a slate gray sky, on a pale white horse, a yellowed skeleton in black armor rides across a landscape. Beneath him, one sees a dead body laid out, a corpse whose crown has fallen from its head. A small baby and an adolescent girl kneel at the hooves of the marching horse, not fighting their fate. A bishop in ornate robes stands praying, but from the viewer’s vantage point, we see he is in the path of the horse. The horse’s bridle is leather and adorned with skulls. In his right hand the skeleton holds the reins and steadies the horse ahead. In his left hand he carries a mast; its flag is black with a white five-petal flower blooming. Off in the distance is a lake or sea with a large warship, its giant sail most prominent, but still almost a speck. The sun is setting at the card’s far right. It is perfectly aligned between the two watchtowers featured in The Moon card. There is little redemption in the scene depicted on this card. The people are dead or dying. Neither surrender nor prayers seem to help. The triumphant flag is to be planted as a flower on one’s grave, cold and colorless. The warship off in the far distance lets us know that the littlest incident in our past may have led to this current state of utter immolation. The horse’s leg is raised in a slow march on a certain path, so nothing there will be spared. 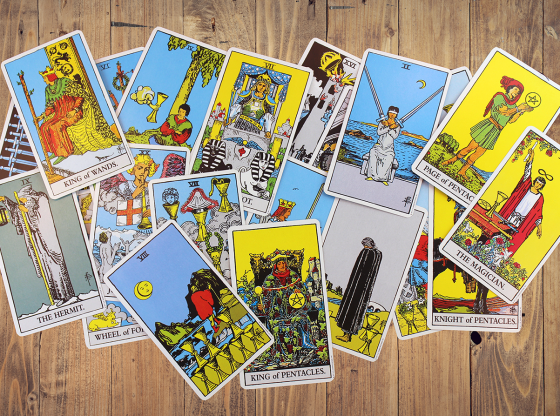 This is an indication that the sweeping changes surrounding you are providing some opportunity. Changes that cannot be stopped are ones that can at least be harnessed and from which you can benefit. 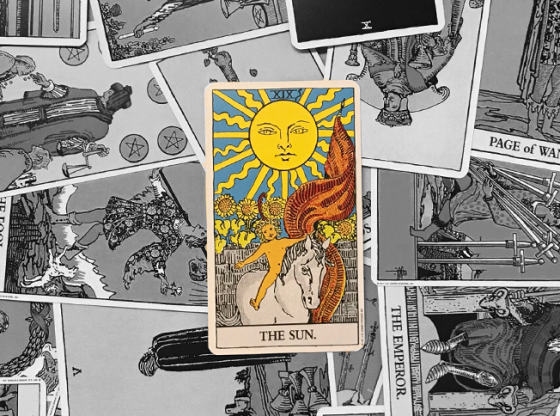 Tarot cards that feature black skies are the ones that give us no way out. The gray sky is one of neutrality. The powerful and permanent changes that are taking place might adversely affect you, and they might not. 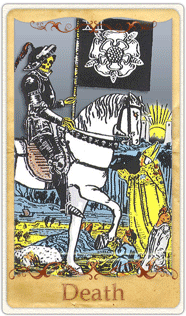 If change is not your enemy, you may not mind the change symbolized by the Death card that is on its way. This is not a card that signals “your” death. 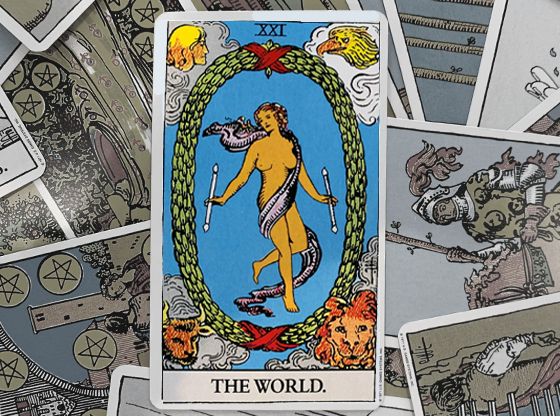 It is a card that signals a definite ending, an absolute transition and an elimination of much of the past. It is the death of the way things have been, but you will be around to be part of the new order of things. 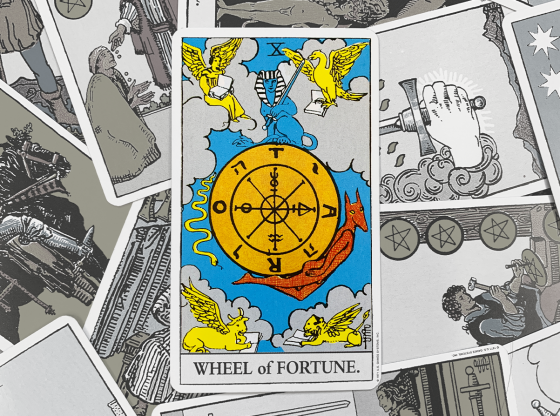 Your Tarot reading is divided into sections: your past, your present and your future. 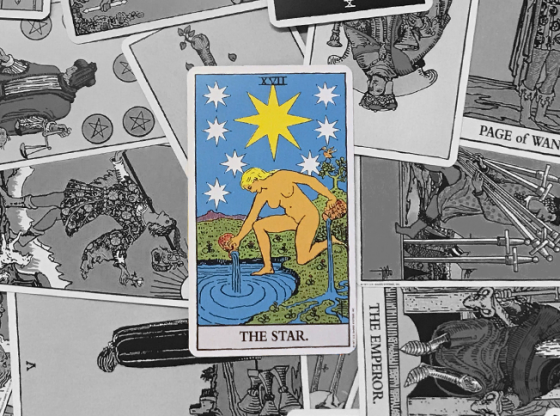 Where a card lands affects what it means to you and to your overall reading. Death is probably best in the past position. This indicates that you have gone through a wrenching change that involved loss and a helpless inability to do anything about it. Whether it was a childhood scar or a recent breakup, this card here is solidified as no longer being able to capture you. It may be the concrete foundation on which your present situation rests, but it is most definitely not a surface that will come back to haunt you in anything other than bad memories. The permanence of what happened is lessened in power by the finality of it all. 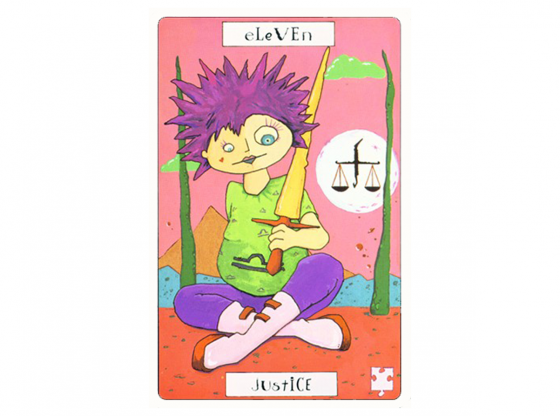 In the present position, this card indicates that you are paring down to the minimum to deal with a massive change in your life. You may be breaking up or under great duress. You might be worried about your job and out of touch with the world around you as obsessions about the economy become preoccupations. You might be involved with a foreclosure or other tragic loss of personal property. One thing about the Death card is that it is impossible to fight. You might want to consider accepting the fate that has occurred and seek to work within it today for a happier tomorrow. The Death card landing in the future position is ironic in that we are all going to die. But in the near-term future, this is more an indicator of the impending death of a close friendship or previously strong relationship. If you have a secure job, check again. Perhaps you should start reading up on business websites to see if your company is financially strong and economically sound. 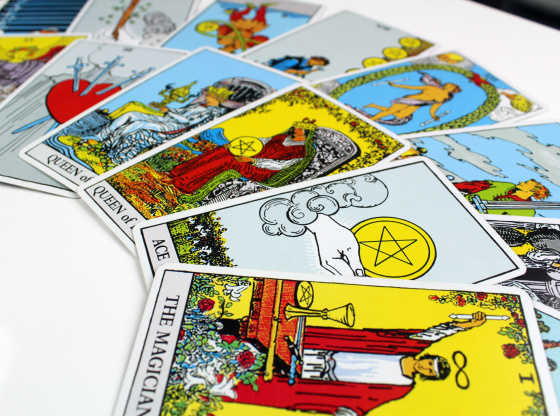 Your Tarot reading features a few cards from the deck interacting precisely to ensure that cards influence each other. Death is a powerful card. 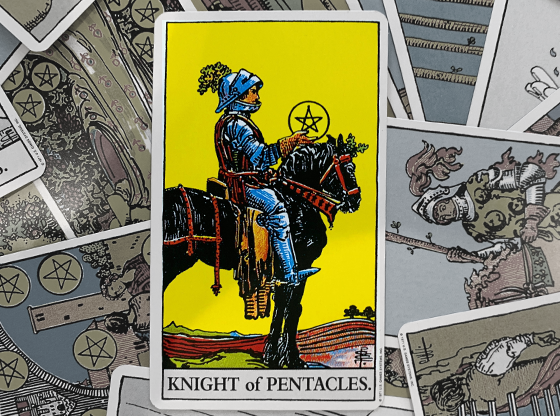 It is hard to mitigate the absolute changes it delivers, but other cards in the reading can give specifics in regards to where the changes it has in store will most likely affect you. The Empress card is the most closely allied with Death. She is card #3 and he is card #13. She represents abundance, he represents plight. When she and he are in your reading together, look for an unexpected windfall to have more disastrous consequences than benefits. 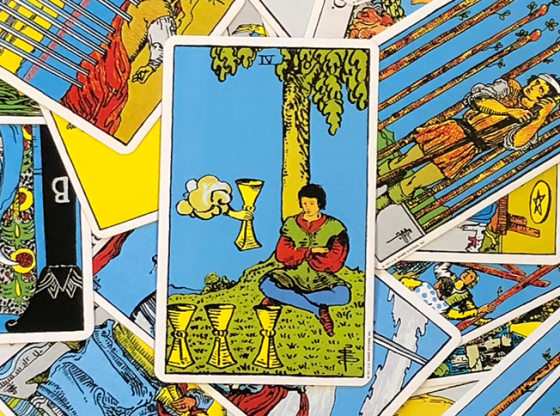 Learn more about the connection that Death shares with the other cards numbered three in the Tarot deck. 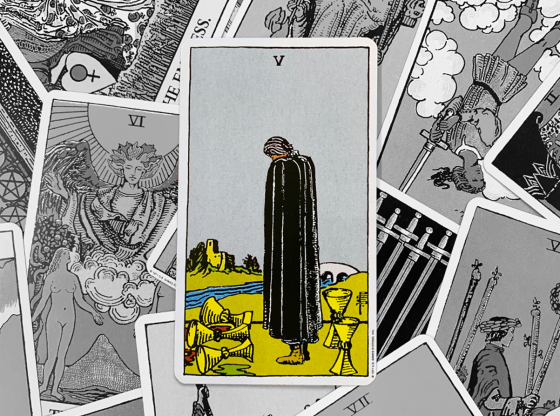 When Death and The Hermit card appear together, your feelings of frustration center on the end of a good time in your life. These feelings are compounded because you have been left alone and unable to properly cope with overwhelming transitions. This card pairs well with The Tower in that you are at least assured that you did very little to cause all of the endings in your world. You do not have to take responsibility for the weather nor for acts of a divine nature. The Moon is an intense complement to Death because its twin towers are pictured on both cards. A point in life may be reached where you are so emotionally disrupted that you need to make radical changes in your world. The combination of the Moon’s emotional hunger and Death’s transformation drives many people to finally make that great change in their lives, be it to end an abusive relationship, quit smoking or move to a better part of town. The Moon signifies the emotions of many years finally bubbling over like hot water in a boiling pot. The Death card makes that change actually occur.